The Neapolitan Mastiff is very trustworthy and reliable. This dog breed can be rather forceful making it a good watchdog. This dog can be distrustful of strangers, making him seem more intimidating. 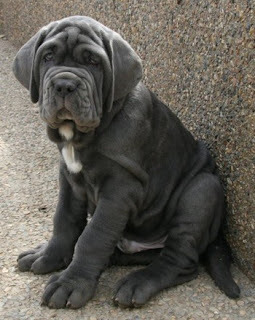 The Neapolitan Mastiff is a very faithful dog breed and will protect his family and property. This breed is big and powerful, and should not be left free around small infants, however is very affectionate. The Neapolitan Mastiff, no matter how large or intimidating, is not threatening. It is very loving , and surprisingly kind. Despite the fact, it has a strong protective drive making it a regularly used guard or watchdog. This breed is very well with children if they are older, and can do well with other pets if properly socialized and trained. The Neapolitan Mastiff, known for his extensive line, has a very short and dense coat. The coat should be of the same length all over the body. Hair should remain straight, and should not have any binding. The Neapolitan Mastiff is very easy to care for grooming wise. Brushing with a rubber brush occasionally will remove dead or loose hair. This is an average shedding breed. To avoid dominance training should be started at an early age. Firm and consistent trainer is advisable. This breed needs long walks at least two long walks per day for being healthy. The Neos doesn’t feel good in hot weather, this weather can cause heart attacks for this dog breed. The average age of this breed is 7 to 9 years, they don’t live long. But if proper diet and exercise is given to this breed every day, then it can live a long and healthy life.